What is cart Abandonment Reminders Campaigns ? This campaign can be triggered when the user hasn’t completed his purchase and has products in cart. Why cart Abandonment Reminders Campaigns ? Any circumstance for a transaction takes place is a perfect opportunity to send this kind of email. This helps is maintaining a rapport with the customers. 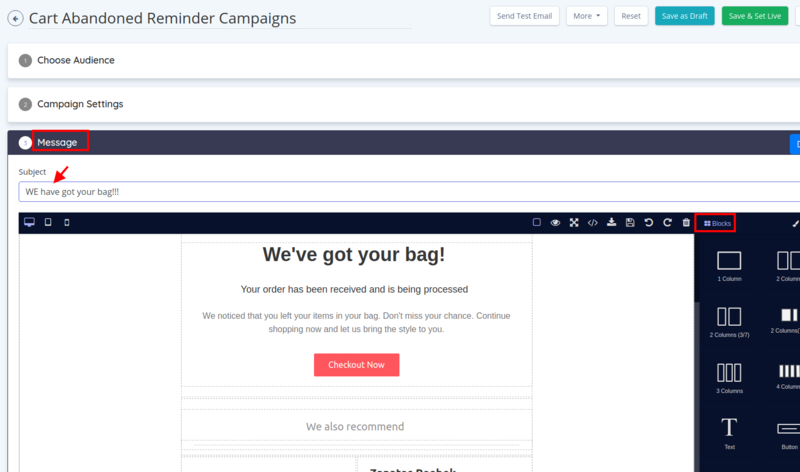 How to create a cart Abandonment Reminders Campaigns ? Match all customers whose order status is unpaid and the last ordered on is more than 2 days ago. Make sure to enable the abandoned cart check box. Only when the checkbox is clicked, the campaign mails will be sent multiple times for one email. In message section, draft the mail content. Click “Save and set live”.